The Trump administration has never spoken with a coherent voice on immigration. Its immigration initiatives have been politically driven, some of them purely symbolic (the 2,000 mile wall), others unconstitutional (a “Muslim ban”), still others longstanding national priorities (“extreme vetting” and the deportation of violent criminals). What may ultimately distinguish the administration’s immigration approach, however, is its apparent hostility to refugees and to “legal” immigrants; that is, other than the wealthy, highly credentialed elites that the president habitually attacks in other contexts. Thus, the administration has endorsed the RAISE Act, which would slash legal immigration levels, particularly for family-based immigrants. At a time of record numbers of forcibly displaced persons, it also intends to reduce US refugee admissions levels. And it has eliminated the Deferred Action for Childhood Arrivals (DACA) program, without pushing for any concrete, legislative substitute. It now threatens to terminate temporary protected status (TPS) for Haitians and then possibly for other national groups whose countries cannot accommodate their return. TPS allows nationals from designated foreign states – those experiencing armed conflict, natural disaster, or other “extraordinary and temporary” conditions that prevent their safe return – to obtain legal status and to work. To qualify, persons from designated states must be residing in the United States on a specified date, pay a fee, register and (as necessary) re-register, and meet continuous residency and other requirements. The program – which has saved countless lives — has been used sparingly. At present, 325,000 persons from 13 nations benefit from this status. Typically, the conditions that give rise to TPS designations do not abate within the initial six to 18 month designated period, necessitating extensions. TPS has been criticized as a temporary program that, in effect, leads to permanent residence. It would be more accurate to say that it has provided indefinite permission to remain for certain national groups. In particular, it has been repeatedly extended for qualifying nationals from El Salvador (since March 9, 2001), Honduras (January 5, 1999) and Nicaragua (January 5, 1999). However, these states represent outliers and, each year, the number of beneficiaries from them decreases due to departures from the United States, failure to re-register, and beneficiaries who obtain permanent status through non-TPS channels. What is certain is that TPS recipients substantially contribute to US communities and are strongly vested in our nation. Revoking TPS for El Salvadorans, Hondurans and Haitians – who represent the overwhelming majority of beneficiaries (302,000) — would ill-serve their nations of origin and would be disastrous for US families and communities. 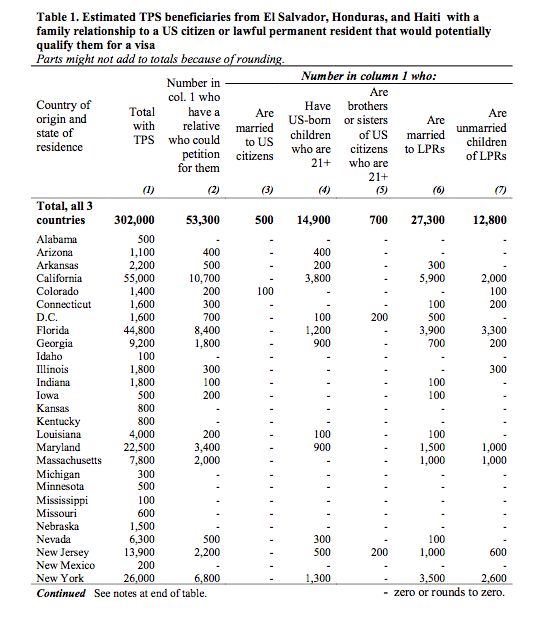 The Center for Migration Studies (CMS) will release new estimates this week that show that 53,300 TPS beneficiaries from these three nations have a close family relationship to a US citizen or LPR that potentially qualifies them for a visa. Most are certainly already on a path to permanent status. The labor force participation rate ranged from 81 to 88 percent, well above the rate for the total US population (63 percent). Of the 258,200 beneficiaries (age 16 and over) in the labor force, about 27,000, or 11 percent, were self-employed and, thus, were job creators. TPS populations worked in high numbers in construction (51,700), restaurants and other food services (32,400), landscaping services (15,800), child day care services (10,000), and grocery stores (9,200). 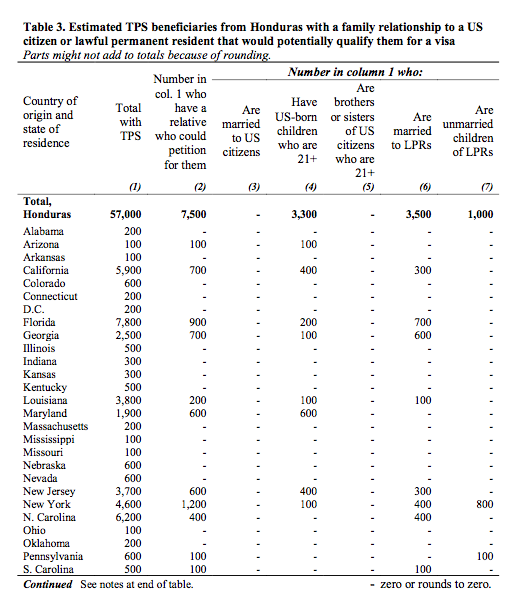 They overwhelmingly lived in six US states: California (55,000), Texas (45,000), Florida (45,000), New York (26,000), Virginia (24,000), and Maryland (23,000). Of the 206,000 TPS households, 61,100 (roughly 30 percent) had mortgages. About 68,000, or 22 percent, arrived as children under the age of 16. The population had a total of 273,200 US-born children—192,700 from El Salvador, 53,500 from Honduras, and 27,000 from Haiti. 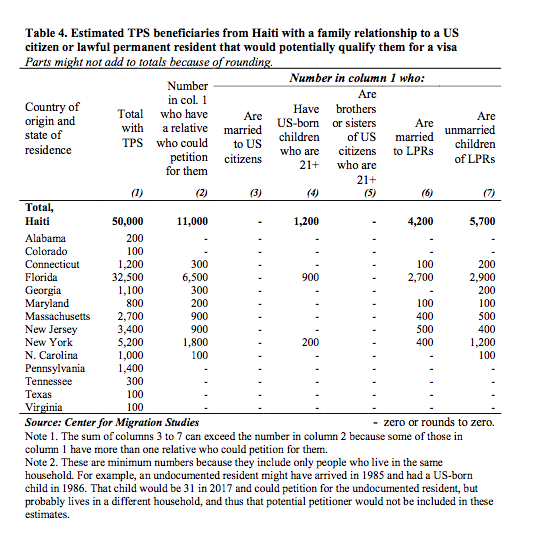 More than one-half of El Salvadoran and Honduran, and 16 percent of the Haitian TPS beneficiaries had resided in the United States for 20 years or more. Eighty-seven percent speaks at least some English, and slightly over one-half speak English well, very well, or only English. 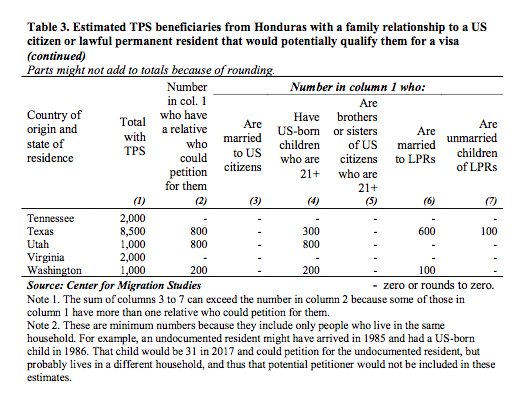 Given their strong connections to the United States, it is clear that US families and communities would suffer substantially from the deportation of TPS recipients. 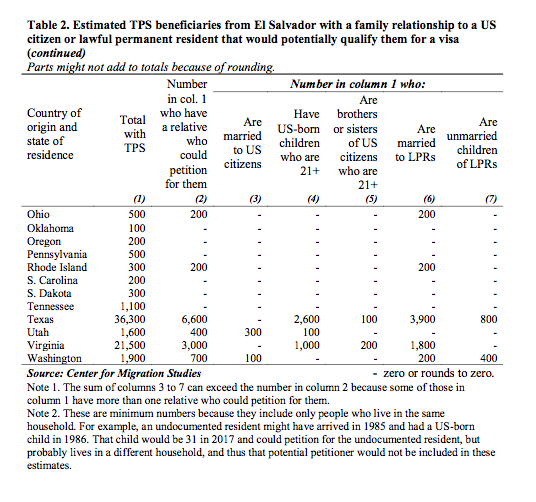 Consider, for example, Texas and Florida, the states with the second and third highest TPS populations. In the wake of Tropical Storm Harvey and Hurricane Irma, they will require massive, multi-year reconstruction efforts, and can ill-afford the deportation of their resident construction workers. Nor can nearly 300,000 US-born children afford the loss a parent. Moreover, El Salvador, Honduras and Haiti cannot ensure the safe and productive return of their nationals. 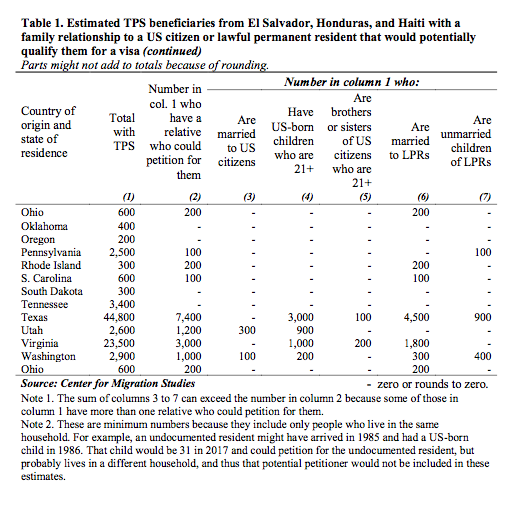 As the administration considers terminating TPS for these groups, the question arises: why add to the US undocumented population yet another category of legally present residents who are vital and contributing members of US families and communities, many of them already on a path to permanent residence? This essay first appeared in the Huffington Post on October 1, 2017. Parts might not sum to totals because of rounding. 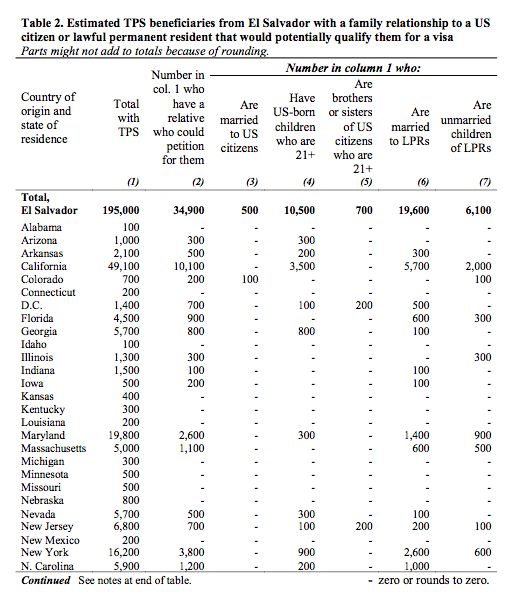 CMS’s estimates assume that the children of US citizens, including married sons and daughters, already have citizenship.